"My family loves this recipe. It is easy and delicious. 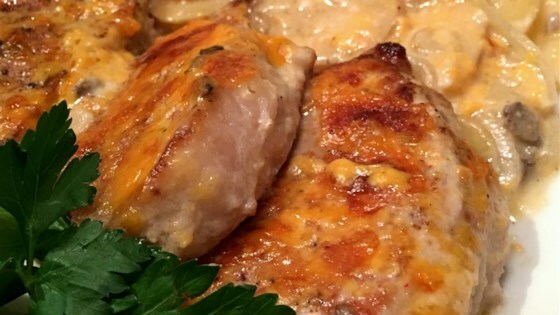 Pork chops are browned, then baked in a creamy mushroom sauce with potatoes, onion and cheese." Heat oil in a large skillet over medium high-heat. Place the pork chops in the oil, and sear. In a medium bowl, combine the soup and the milk. Arrange the potatoes and onions in a 9x13 inch baking dish. Place the browned chops over the potatoes and onions, then pour the soup mixture over all. Bake 30 minutes in the preheated oven. Top with the cheese, and bake for 30 more minutes. A simple, delicious hearty meal!